Merge sort is an algorithm that is n * log n in runtime complexity. It’s a divide and conquer algorithm that splits a given list in half recursively, until each list only has 1 element in it. Then it merges these lists back into one big list by sorting each one of these smaller lists and merging them back up into larger and larger lists. Merge Sort follows the rule of Divide and Conquer to sort a given set of numbers/elements, recursively, hence consuming less time. 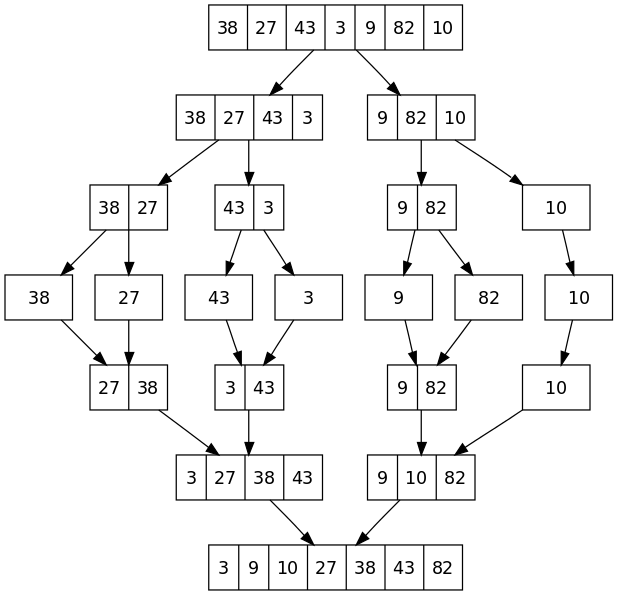 Both merge sort and quicksort employ a common algorithmic paradigm based on recursion. This paradigm, divide-and-conquer, breaks a problem into subproblems that are similar to the original problem, recursively solves the subproblems, and finally combines the solutions to the subproblems to solve the original problem. Because divide-and-conquer solves subproblems recursively, each subproblem must be smaller than the original problem, and there must be a base case for subproblems. Divide : Divide the problem into a number of subproblems that are smaller instances of the same problem. Conquer : Conquer the subproblems by solving them recursively. If they are small enough, solve the subproblems as base cases. Combine : Combine the solutions to the subproblems into the solution for the original problem.